Scores of women in the UAE have responded positively to a call from Zulekha Hospital to take responsibility for their breast cancer health in a new awareness campaign. More than 1,800 women in the emirates have taken advantage of a free breast cancer consultation, while 763 x-ray mammograms have been undertaken at Zulekha Hospital in Dubai and Sharjah as part of the Pink It Now campaign which was launched in October during the Breast Cancer Awareness month. 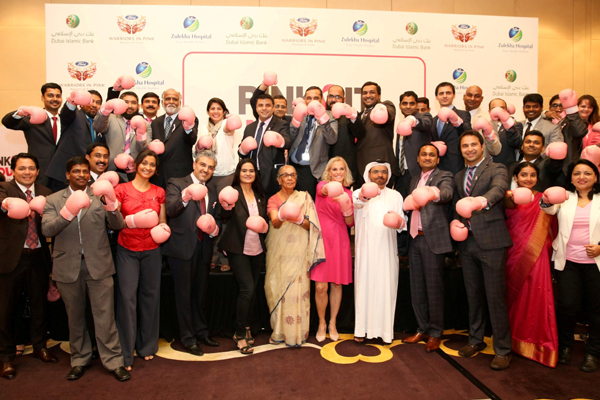 The initiative was developed exclusively by Zulekha Hospital with the support of Ford Warriors in Pink, a Ford Motor Company breast cancer awareness initiative, and Dubai Islamic Bank. From October 1 to December 31, the Zulekha hospitals in Dubai and Sharjah offered women the opportunity to take advantage of free specialist consultations by its oncologists and surgeons as well as receive free mammograms. The Sharjah hospital held 1,116 free consultations and 445 x-ray mammograms, while in Dubai the hospital received 703 women for free consultations and a total of 318 for mammograms, out of which 13 cases were diagnosed positive. The campaign forms part of a worldwide initiative to build awareness and educate women on breast cancer and the importance of regular check-ups and early detection. It also aims to empower women to beat the disease. Taher Shams, the managing director of Zulekha Hospital, said: "We are very pleased with the success of this campaign and the number of women who have come forward to utilise the opportunity of our free consultations and mammograms."